... lazy update just to update, pretty much, and get in one last post before November is well and truly over. Type slug fully extended as far as it will go - not touching the platen, just lightly grazing the ribbon. Another problem is that the paper bail rests quite close to the plastic guard, perhaps a result of the carriage sitting too low. The shadow of the type slug on the platen - so close. And yet. Look at that carriage - it just isn't sitting right. The groove is where it's rubbing against the shell each time I move it back and forth, wearing off the paint. Does anyone know what the little lever under the left platen knob is for? I doubt it is the key to our problems, but I'm curious as to its function. More scraping on the right side of the carriage. A look at the innards - anything obvious out of place? The carriage lock is the lever on the right, but it seems to be working as intended. Another thing we're wondering is whether the metal nuts above need to be resting directly on the green hole below - it's slightly offset. But how we would manipulate it back, and whether it would make a difference... well, who knows. I have been out and about, as usual, even exploring some new venues to see what - if any - typewriter discoveries could be made. The showroom above - 2,000 square meters of furniture and antiques - was recommended to me by a work acquaintance, and it is in a part of the city I don't often visit, so I made the trip last Saturday. As I expected, they had lots of beautiful furniture and quirky antique objects, all with "Geneva" prices - i.e. not even close to affordable. I would not return, but it was good to see it at least once to know what they had on offer. My theory with these shops - those with lots of display room - is that they are in no hurry to sell anything, hence the elevated prices. Your average flea market seller, who has to physically haul everything from one location to the other, is more willing to entertain offers. There was one typewriter to be found in the jumble - just one. This Continental, with the carriage drawband gaily hanging out of the rails like a thread of spaghetti... yes, they were asking CHF 90. Nice try. With that disappointing excursion behind us, we made our way to the usual flea market, and after walking around for only a few minutes, we found this sitting on one of the tables of an antique furniture dealer. I see this fellow every week, and he usually has the same desks and secretaries (overpriced) on offer every time. This seemed to be a rare offering. He noticed us looking at it and said, "I would usually sell this for 80 francs, but I'd like to make you a special offer - only 50 francs." I suppressed a smile. "Is it too much? ", he asked. I shrugged. Maybe someone would buy it for that much, but I doubted it. It wouldn't be me, that I knew. The best part was when he said, "It's worth far more, these are so rare!" 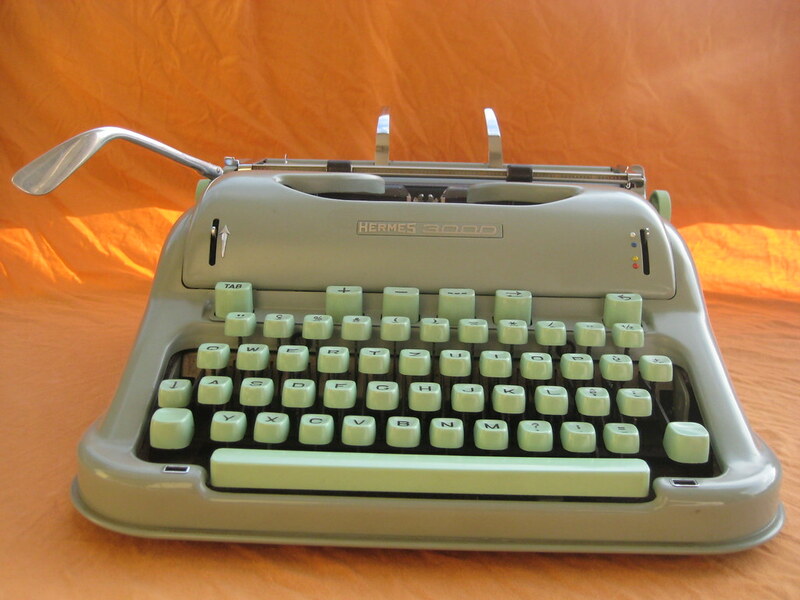 Ah, the eternal rhetorical question: what is my typewriter worth? Slippery slope, this one. I moved on. Not far off was the Remington Portable #1 for which I had been quoted CHF 150. Of course, no one was buying that either. I was a bit surprised to see the CHF 10 Swissa still on offer, and I asked J to look whether he could unlock the carriage, as I had not been able to do it the last time. He tried valiantly, but without success. It's a puzzle - a seemingly spotless typewriter, that refuses to type. Sad. A navy-blue Adler Gabriele 35 - I know many J2s and J5s can be found with this color in the U.S., but this was my first time seeing it. Rather dapper, and it looks less plasticky than the all-ivory version. The funny thing is that I noticed an Olivetti case under this seller's table and was wondering how I would get him to show me the typewriter it contained... when J pointed out the eager young lad clacking away on the Lettera 32's keys, surrounded by torn sheets of paper. What a heartwarming sight! Headless late '60s Hermes Media 3. Rather grimy, too. Poor thing. 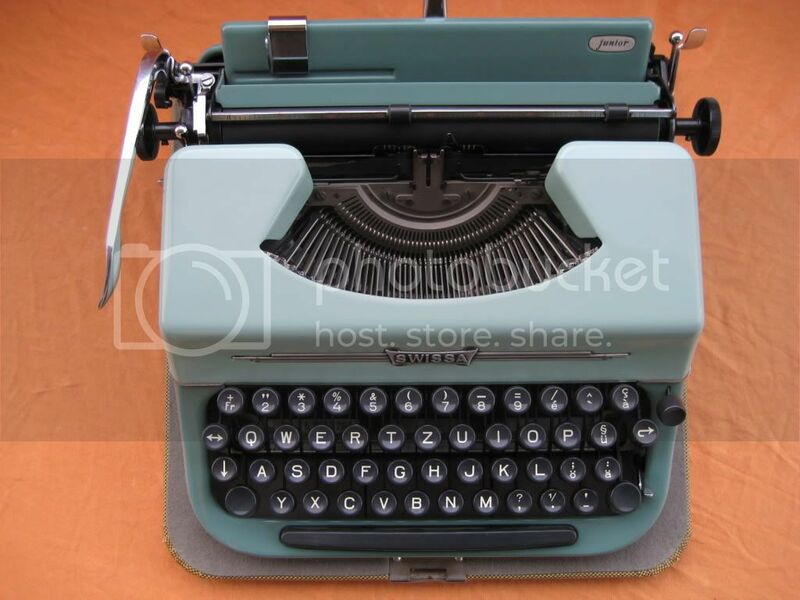 An elite-type Olivetti Studio 44, very nice condition. How come all the script ones in the U.S. never show up here? I'm not complaining, otherwise I'd be far too tempted! Terrible picture, but for the sake of documentation - this Remington Quiet Riter (or Travel Riter?) popped up at a local thrift store. A fitting end to a cold, gray Saturday morning - it appears someone wants their monkee back from UBS? Perhaps the local Occupiers take a break on the weekends - I've yet to see actual people behind the various signs/ graffiti. I would have been curious to hear more about the monkees... pity. Look at that immaculate paint finish! I couldn't be prouder of this thing if I had pulled a Hephaestus and forged it with my bare hands. I made sure to take several pictures before sending it off wistfully. And not without a twinge of regret, but that's ok. In this and all the other pictures, New Baby is on the right - and here you can really see the difference. Old Baby seems to have a few bumps and scuffs, while New Baby is gleaming. Oh, the other thing I almost forgot to mention is that New Baby has a Swiss-French keyboard, as opposed to Old Baby's Swiss-German one. Since the Hermes 3000 was also Swiss-French, this gives Deek a perfect matching set! The great thing about Swiss-French keyboards is that some of them inadvertently have a funny emoticon next to the backspace key... can you make it out? 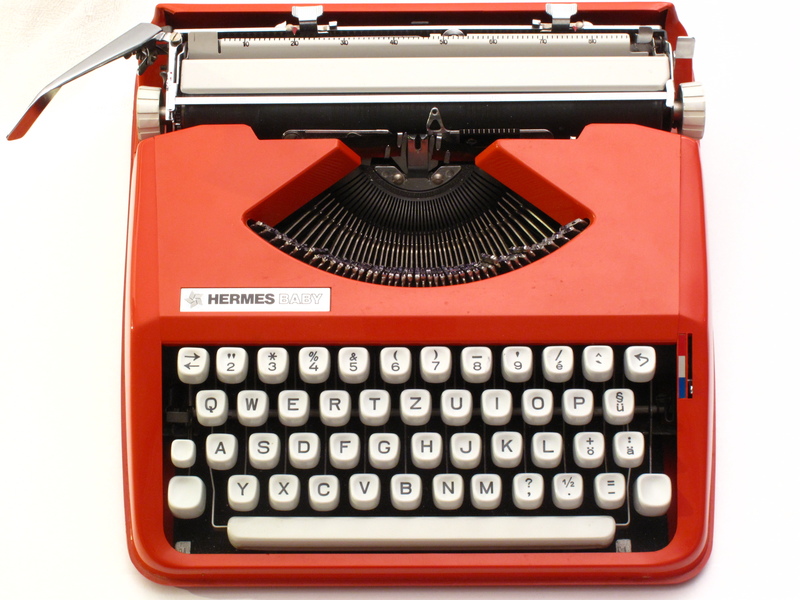 By the way, here is the link to the timeline of Hermes Baby evolution on typewriters.ch. And here's the case - which I suppose looks as though it might contain snow tires? At least that is what someone at the thrift store thought... an error I am grateful for! Retro Tech Geneva: We Might* Get It** For You If You'll Pay For Shipping***. **"It" being the nice finds I sadly leave behind at thrift stores and flea markets. Do note that probability of "It" being a Hermes is quite high - with the occasional Swissa thrown in - and the probability of a QWERTZ keyboard is pretty close to 100%. And I would never want to ship anything bigger than a Hermes 3000! Even a '50s 2000 is cutting it close - those had some hefty boxes. ***Shipping plus the seller's asking price for the typewriter, of course. Current exchange rates apply.